With the weather becoming increasingly unpredictable, extremes are becoming more of a norm. Many companies and organisations in both the private and public sector must consider what equipment they need to tackle a harsh winter season. 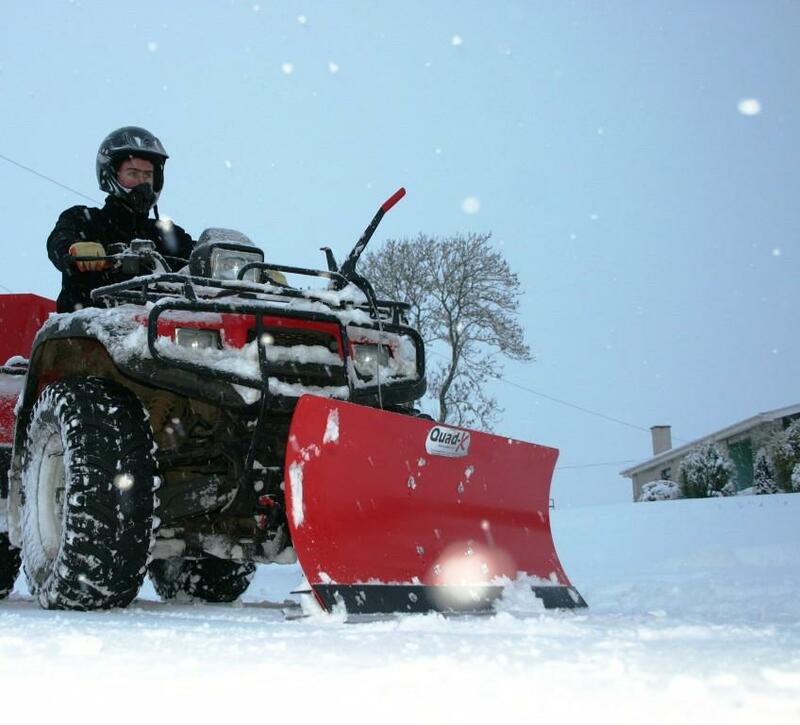 Co Antrim manufacturer Quad-X has designed and developed a range of ATV equipment to deal with ice and snow removal. 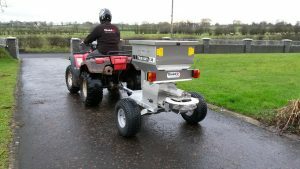 The Quad-X True Grit is a commercial spec salt spreader range, developed in response to the need for a small-scale commercial machine popular with amenities, large companies, farms and hire companies. This spreader is capable of spreading damp salt thanks to the feed mechanism continually pushing material forward, irrespective of moisture and consistency, all to help prevent clogging and facilitate an even spread of salt. The machine is available in various capacities and models including from 130L in a towed model. Spreading can be activated from inside your vehicle and spread width can be adjusted thanks to a user-friendly control unit giving precise control during operation. With an adjustable spinner position, the spread can be offset to the left or right. True Grit spreaders are simple, reliable and effective, providing an affordable alternative to large-scale belt drive machines. 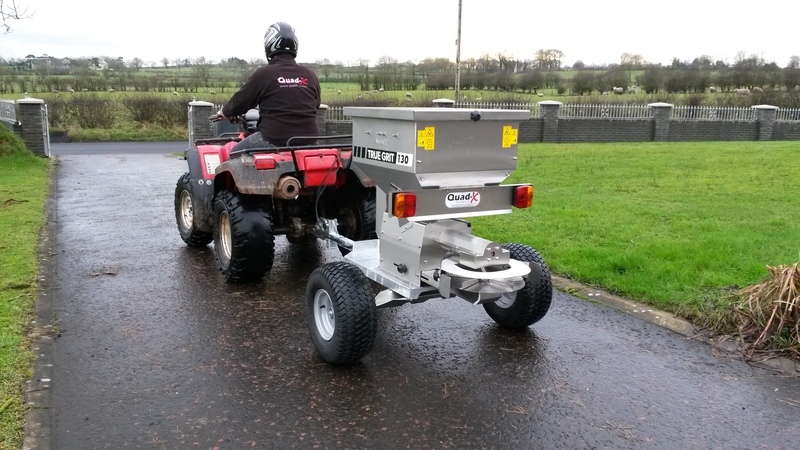 Quad-X also offers an ATV mounted salt spreader, in 60L capacity. The 60L model fits to the rear rack of an ATV and is powered by a 12v motor to ensure an even spread. The plastic hopper is UV stabilized and durable while the stainless steel spinner and shutter plates help reduce corrosion. Quad-X offers a fantastic Irish built alternative to the array of cheap Italian 6 bag spreaders. The 300kg capacity salt spreader is a ground driven, towed machine suitable for gritting larger areas. It is equipped with UV protected plastic hopper, proper wheel bushings, knobby tyres, and dished spinner for excellent spread widths. The salt spreader is specially designed with a specific gearbox with a gearing ratio for better traction in icy conditions. Knobby 18-9.5×8 tyres are fitted as standard, with 4 stud hubs allow for easier wheel changes. These salt spreaders have adjustable flow rates with the necessary deflector plates and special agitator kits for the optimum spreading of salt. 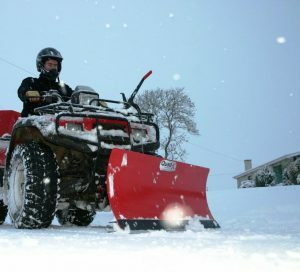 The Quad-X snow ploughs are designed to fit on most ATVs, with wider models to suit utility vehicles and compact tractors. Their innovative ‘SUPERMOUNT’ system with implement angle and quick release is the fastest fitting and most versatile system on the market to turn your quad into a work machine. The Supermount System fixes to the underside of your quad and can be used with numerous Quad-X attachments to help you out this winter. It is a universal fit, and so even if you change your bike the Quad-X system will fit. The Supermount System is designed to work with heavy loads and provides great ground clearance even in rough terrain, thanks to considerable R&D, allowing you to keep it fixed to the quad all year. Quick release clips allow the snow plough to be fitted or removed in less than 10 seconds. The blade can be angled left/right and can be lifted very high since the pivot point is at the front. 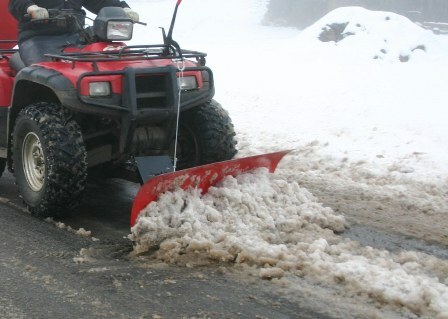 The Snow Plough is spring loaded to cushion collisions with obstacles and is fitted with adjustable skids and a replaceable 2-sided blade to protect the plough. Quad-X also provides a service for those with special requirements, to tailor machines and develop products to suit their application.